Home » General Health » Healthy Microwave Cooking? Yes, It’s True! Healthy Microwave Cooking? Yes, It’s True! Healthy microwave cooking: is there such a thing? When it comes to cooking, microwaves have gotten a bad rap. It could be because they cook food so amazingly fast that it’s scary, or because the “microwave dinners” in your grocer’s freezer tend to be the poster meals for poor nutrition. One of the long-lasting rumors about microwaves is that they zap the valuable vitamins and minerals from otherwise nutritious foods. Cooking vegetables like potatoes and broccoli in the microwave has often been seen as a big no-no if you believe in good health. But I want to set the record straight on what really happens when you cook this way. Yes, there are some nutrients that experience degradation during the cooking process. Vitamin C and vitamin B12, for example, diminish when they are exposed to heat. But the source of heat doesn’t matter; it could be coming from an oven, hot water, or a microwave. Conversely, there are foods that receive improved nutritional value when they are heated. Carotenoids (antioxidants that are in colorful veggies, like sweet potatoes, carrots and tomatoes) are more available when heated, because heat breaks down proteins that allow carotenoids to release. Because microwaves are the fastest option, some specialists contend that it’s the best way to preserve nutrition when cooking. And I tend to agree; I cook nearly all my veggies in the microwave and don’t feel like I’m losing any nutrition. I feel good, strong and healthy, so there’s no reason to think I’m losing nutrition. 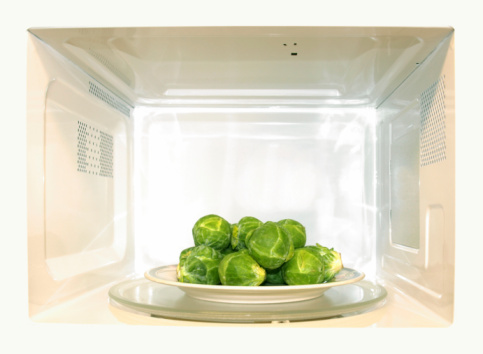 Because microwaves expose nutrients to heat for only a short time, the damage they can do is limited. Other cooking methods, like roasting, frying and boiling can take much longer, thus allowing far more exposure to heat. Furthermore, many new microwaves have raw-veggie presets that determine the best heat intensity and timing. One secret to cooking nutritious veggies in the microwave is moisture—adding moisture actually helps steam the veggies from the inside out, so no portion of the vegetable gets more heat than the other. There are a couple of ways to keep your veggies moist to get equal heat distribution: You can purchase a microwave-safe steam bag, or simply use a plate and cover the veggies. I usually find the water I use to rinse the veggies with is enough, but if you want extra moisture, add 1 tbsp. of water per cup of veggies, make sure the plate or bowl is covered, and stir it halfway through. If you’re eating a balanced diet, then how you cook your veggies is of little concern. Any amount of trace nutrients lost will be inconsequential because you’re likely getting it from other sources anyways! So don’t be scared of your microwave. Not only can you enjoy nutritious foods quickly and conveniently— it might just be the healthiest way to cook! Pellegrini, N., et al., “Effects of different cooking methods on color, phytochemical concentration, and antioxidant capacity of raw or frozen brassica vegetables,” Journal of Agriculture and Food Chemistry, March 10, 2010; http://pubs.acs.org/doi/abs/10.1021/jf904306r. Howard, L., “Beta-carotene and ascorbic acid retention in fresh and processed vegetables,” Journal of Food Science web site, June 28, 2008; http://onlinelibrary.wiley.com/doi/10.1111/j.1365-2621.1999.tb15943.x/abstract. Harvard Medical School, “Microwave Cooking and Nutrition,” Harvard Health Publications web site, January 2, 2015; http://www.health.harvard.edu/staying-healthy/microwave-cooking-and-nutrition.